New York is in an uproar. Seats for the crowds being erected all through the line of March. Telegraph poles being pulled down and altogether things are lively. Last night the City was dark as we had no electric light & the gas was not in good trim. Everything looked gloomy out of doors. A million people are expected to be here on the 30th. Glad I am not a visitor and have my room on a side street. No renting of windows. Mrs. Simmons came on Monday and will remain until after the Centennial. Mrs. Dolman is coming on the 27th and will stay until the Centennial is over. Where she will get a chance to see the parade I do not know, but she is one of the investigating kind and will find something, I suppose, to sit on. Mrs. Nagle has bought two seats at $3 each. Today tried to get two more, but they were gone. Windows are selling at $100 & $150 each. "What fools these mortals be". Telegraph poles being pulled down "As early as 1870 the Real Estate Record and builders' Guide had opposed the use of aboveground telegraph lines, the multiplication of which led to" the disfigurement and obstruction of our street." By 1878 the problem of overhead telegraph wires in the city's business district had grown to such a point that there were calls for laws requiring that they be buried.. By the early 1880s, with the widespread use of the telephone, the problem had grown much worse. ..In 1883, the New York Board of Alderman voted to require the burial of wires within two years. Many argued that this process should be part of a larger infrastructure project, the construction of a "Subway" in which gas and water mains, steam pipes, pneumatic tubes, and all manner of cabling could be housed. ... the great blizzard of 1888 would unexpectedly intensify the urgency of subway construction ... On April 16, 1889, a crew of workers armed with axes and shears climbed the tall telegraph poles at Fourteenth Street and Broadway and, before crowds of cheering citizens, toppled them to the ground, thereby striking a decisive blow in the long awaited war against the city's most visible symbol of technological blight: Overhead Wires, in Stern, Robert, Thomas Mellins and David Fishman, New York 1880: Architecture and Urbanism in the Gilded Age, New York: Monacelli Press, 1999 pp 59-61. The City is full of people, bands playing and everything in a perfect hurrah! Mrs. Dolman arrived in the rain on Saturday. She has been out a little today, but has not seen many of the sights. I shall be only four weeks in Boston and will see you on my return. Please yourself however but I shall not "get mad at you" if you do not come, for as you cannot stay but only a few hours, it does not seem right to spend so much in RR fare. 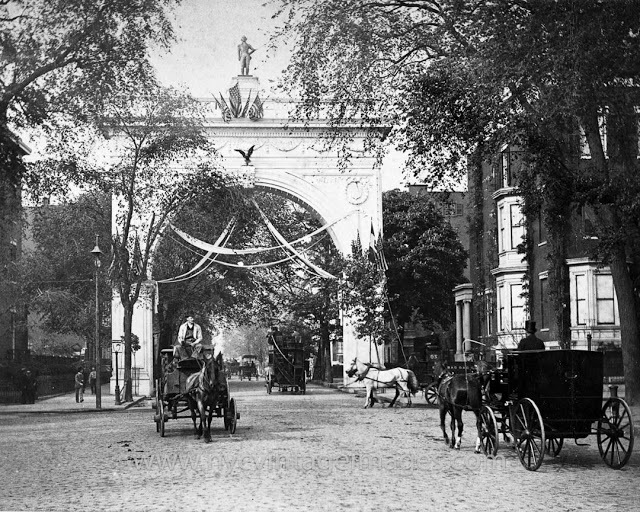 During the Centennial celebration a temporary arch (designed by Stanford White) spanned Fifth Ave. A permanent arch (also designed by White) was put up in Washington Square in 1890-1892. 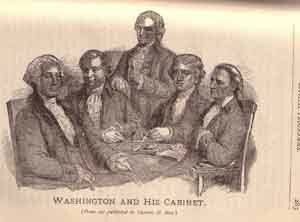 Wikipedia http://en.wikipedia.org/wiki/George_Washington%27s_legacy#Centennial_celebration accessed March 24, 2011 "The centennial anniversary of Washington's inauguration as President fell on April 30, 1889. In observance of the occasion President Benjamin Harrison followed the itinerary of one hundred years before, from the Governor's mansion in New Jersey to the foot of Wall Street, in New York City, to old Saint Paul's Church, on Broadway, and to the site where the first Chief Magistrate first took the oath of office. 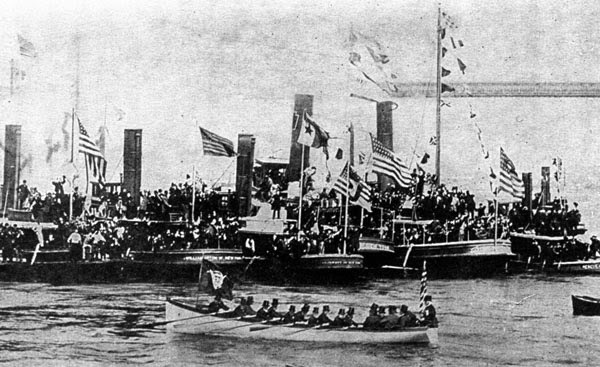 Three days were a round of naval, military, and industrial parades, with music, oratory, pageantry, and festivities. For this Centennial Whittier composed an ode. 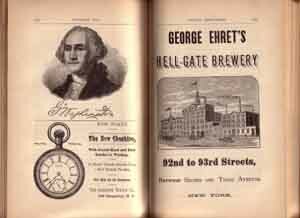 The venerable S. F. Smith, who had written "America" fifty-seven years before, was also inspired by the occasion to pen a Century Hymn"
Souvenir and Official Celebration of the Inauguration of George Washington, compiled and edited by John Alden, New York: Garnett & Gow, 1889 A hardbound volume, almost 400 pages. Found on Amazon in 2004 via collaborative filtering.